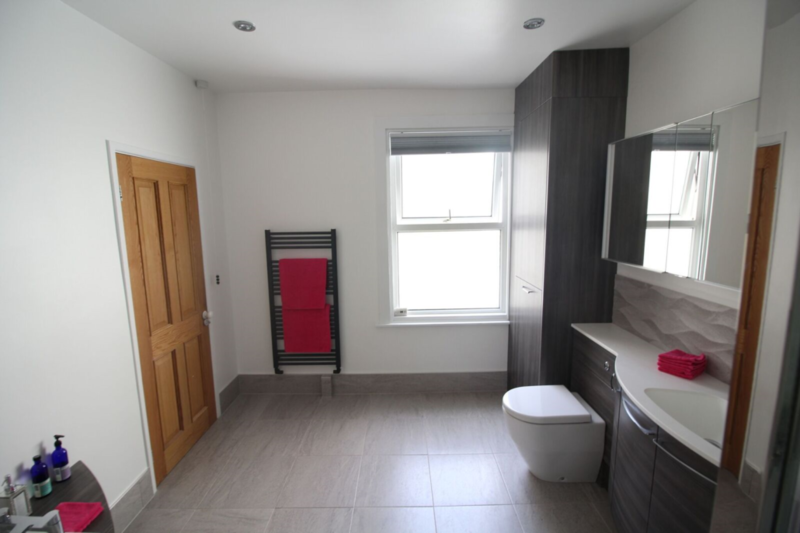 To update the family bathroom using high quality luxury products that will provide a relaxing haven. Replaced the fitted furniture with high end Utopia curved basin and WC Unit. 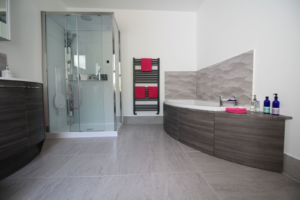 Matched this furniture with the specific Utopia Symmetry Bath and to add clever additional storage, partnered the bath with the bespoke Symmetry Bath Panel and Storage Cupboard. As the room was a converted bedroom, ensuiring the room had the right warmth in the colder months we plumbed in 2 Bisque Deline Radiators in the stylish volcanic colour. 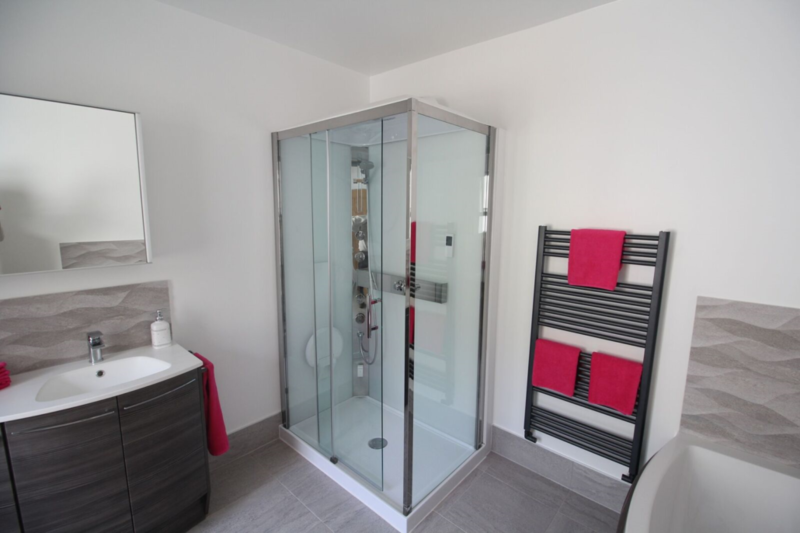 The clients enjoy showers and were taken with the Novellini shower cabin, that combines the usual shower facilities of a large shower head and hand held shower with the additional features of steam, music, lights and a seat. A pure indulgent and luxury item that will give our well deserving clients years of wellness and relaxation. 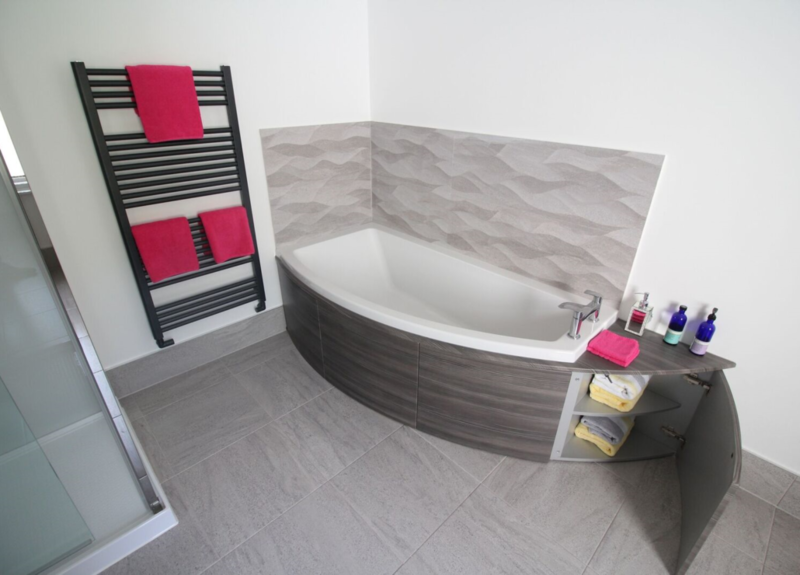 To fit the size of the room, we used large sized floor tiles and kept the wall tiling to a minimum. 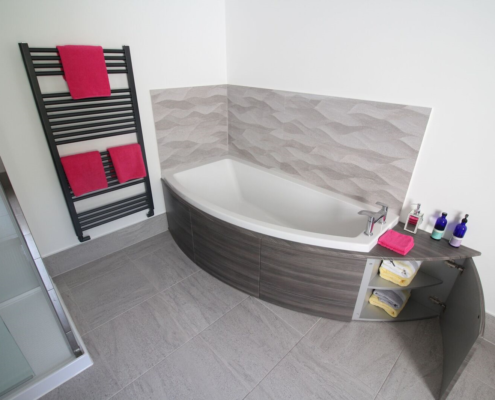 To enhance the status of the room we used the beautiful Porcelenosa Ona Natural tiles that come with a stunning wave effect pattern. 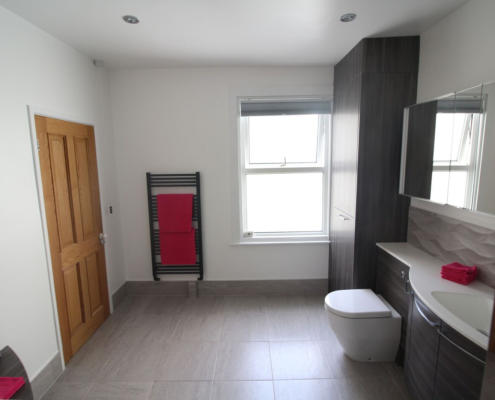 As you can see from the before photo’s, the bathroom contained the combination boiler. 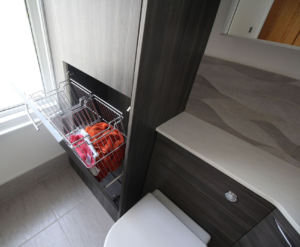 Our clients wanted to hide this and also add storage and linen baskets to this area. Naturally this is not an off the shelf product you can buy, so our in-house talented carpenter Adam, used his skill and creativity to produce exactly what the client wanted – all in the matching colour of the Utopia grey linear! 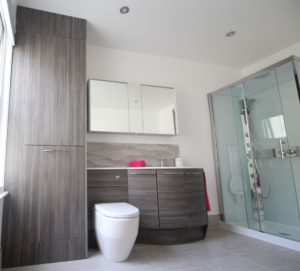 We are really delighted with the outcome of this room, as were are clients. 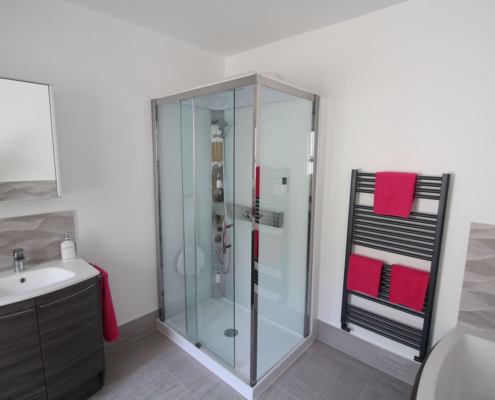 The room benefitted from the top class specification of the products and the room was superbly finished off by installing the 1300mm Mirror Cabinet, made by the market leading high end cabinet maker, Keuco. 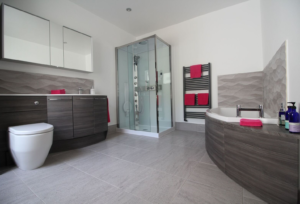 Utopia Symmetry 3 Door Curved Offset Washbasin Unit with Integrated Toilet Unit (in Grey Brown Linear) with 20mm Polaris White Solid Surface Marble Worktop.